Feud is an American anthology television series for FX created by Ryan Murphy, Jaffe Cohen, and Michael Zam, presented as the dramatization of actual events. It premiered on March 5, 2017. The first season, which consists of eight episodes, is subtitled Bette and Joan and chronicles the rivalry between Bette Davis and Joan Crawford during and after the production of their 1962 film What Ever Happened to Baby Jane? In February 2017, FX renewed the series for a 10-episode second season. Originally titled Charles and Diana, referring to Charles, Prince of Wales and Diana, Princess of Wales, the season was later renamed Buckingham Palace. In August 2018, it was announced that Buckingham Palace had been scrapped. The first season, titled Bette and Joan, centers on the backstage battle between Bette Davis (Susan Sarandon) and Joan Crawford (Jessica Lange) during and after the production of their 1962 film What Ever Happened to Baby Jane? Daniel Hagen as Michael Luciano, film editor of What Ever Happened to Baby Jane? In 1978, filmmaker Adam Friedman interviews Olivia de Havilland and Joan Blondell for a documentary about the complex relationship between Joan Crawford and Bette Davis. Seventeen years earlier, with her career gradually waning, Joan pitches a film adaptation of the horror novel What Ever Happened to Baby Jane? to Bette and director Robert Aldrich. Aldrich, in turn, brings Baby Jane to Jack L. Warner, who comes on board despite his hatred for both women. But as filming begins, Joan's acute narcissism and Bette's strong opinions quickly put them at odds. Bette and Joan act on their shared interest to eliminate a showy supporting actress, but their problems at home spill over at work. Jack forces Aldrich to create a power play between the two actresses for hype. Bette and Joan learn some intimate details about each other, but their animosity climaxes on set as filming winds down. Contrary to all expectations, Baby Jane is a huge hit. With no other film offers coming in, Joan's jealousy grows as Bette's performance is critically acclaimed. She fears that she will not get an Oscar nomination, but that Bette will. Meanwhile, Pauline hopes to direct her own film, but is discouraged by the lack of support from both Aldrich and Joan. Bette is on track to win a record-breaking third Best Actress Oscar. Joan and Hedda Hopper launch a clandestine campaign against her. Joan bullies nominee Geraldine Page to skip the ceremony and allow Joan to accept the award on her behalf if she wins; Anne Bancroft, unable to attend, also allows Joan to accept her award. Offering herself as a presenter, Joan arrives dressed like a "silver Oscar". With a shocked Olivia de Havilland and crushed Bette watching, Joan accepts the Oscar for Bancroft. As Joan promotes her new film, Strait-Jacket, Jack enlists Aldrich to write and direct a new film in the successful "Hagsploitation" genre. Aldrich ultimately takes his script, called Hush...Hush, Sweet Charlotte, to Darryl F. Zanuck to produce, angering Jack. Aldrich is able to lure Joan in return for top billing, and Bette in return for creative control. Bette becomes increasingly unreasonable, and Joan's suspicions about Bette's influence over Aldrich are confirmed when Joan hears Bette having a bottle of champagne with him. With Robert's divorce pending, he and Bette have an affair. On location filming Hush...Hush, Sweet Charlotte, Joan feels disrespected by the production (especially after being left behind when the production wrapped in Baton Rouge), and comes to resent Bette's creative input as a producer. Bette, on the other hand, is relishing in her new role as producer but is haunted by Jack Warner's mistreatment when she first started out in Hollywood. When filming returns to Los Angeles, Joan fakes an illness to stall production in hopes that 20th Century Fox will cancel the film. She eventually learns that the studio is suing her for breach of contract, and while in the hospital learns via radio announcement that she has been replaced by Olivia. Hysterical, Joan destroys her hospital room, and Mamacita leaves her. Following the critical failure of her latest film, Trog, and bad publicity photos, Joan officially retires from acting. In the years following, she moves to New York City. Realizing how miserable she is alone, she makes amends with Mamacita and her daughter, Cathy. One night, Joan hallucinates seeing Jack and Hedda in her apartment having a party, where she joins them and is later joined by Bette. In the fantasy, Joan and Bette end their feud and speak civilly toward each other about one another. In mid-1977, Joan's health deteriorates rapidly and she dies with Mamacita at her side. Meanwhile Bette, who has worked consistently since Sweet Charlotte, learns of Joan's death via a journalist who asks for comment. Bette responds with one final negative comment towards Joan. At the 1978 Academy Awards, Adam finishes his interviews for his documentary, with Bette refusing to be a part of it. Bette, Olivia and others express sadness at Joan's brief appearance in the In Memoriam segment, while simultaneously being horrified by the brevity of the moment. A flashback to the very first day of filming Baby Jane shows Bette and Joan chatting happily before going into their separate trailers. Ryan Murphy, a fan of Davis since his childhood, interviewed the actress just months before her death in 1989. The agreed-upon 20-minute interview lasted four hours, and inspired his characterization of Davis in Feud. He said, "When I would ask her about Joan Crawford ... She would just go on about how much she hated her. But then she would sort of say ... 'She was a professional. And I admired that'." Murphy first conceived Bette and Joan as a film years before the FX series, and approached both Sarandon and Lange about the lead roles. Sarandon said, "It just felt like it didn't have a context, just being bitchy and kind of funny, but what else? In expanding it to eight hours, you could get more complexity and so many other characters." Season 1 of Feud was being written at the same time that Murphy was forming his Half Foundation, which promotes an increased presence of women in film and television production positions. The season features 15 acting roles for women over 40, and half the episodes were directed by women, including Helen Hunt. Feud, developed by Murphy, was picked up to series by FX on May 5, 2016. Season 1's Bette and Joan is inspired by the real-life feud between Crawford and Davis, and explores issues of sexism, ageism, and misogyny in Hollywood. Its eight episodes were expanded from a feature-length screenplay Murphy had optioned called Best Actress by Jaffe Cohen and Michael Zam. Sarandon said, "In our story, it was a fact that [the people behind Baby Jane] encouraged the animosity [between Crawford and Davis], first of all to control them, second of all to make what they thought was more onscreen tension, and that really hasn't changed a lot." Melanie McFarland of Salon wrote that the series shows "just how brutal the Hollywood system was on some of the greatest talents in its firmament" and that it "cuts to the root of why collaborating and delighting in the fall of the mighty is eternally marketable." The Crawford-Davis feud was also documented in Shaun Considine's 1989 book Bette and Joan: The Divine Feud. On February 28, 2017, FX renewed the series for a 10-episode second season, subtitled Charles and Diana. The season was to center on the relationship between Charles, Prince of Wales and Diana, Princess of Wales, with Murphy and Jon Robin Baitz attached as writers and executive producers. It was later renamed Buckingham Palace. On August 3, 2018, it was announced that plans for Buckingham Palace had been scrapped, but that Murphy still intends to do further cycles of Feud. Jessica Lange and Susan Sarandon were attached to star as Joan Crawford and Bette Davis. Alfred Molina, Stanley Tucci, Judy Davis, and Dominic Burgess were also a part of the cast, in the roles of Robert Aldrich, Jack L. Warner, Hedda Hopper, and Victor Buono, respectively. In August 2016, Catherine Zeta-Jones and Sarah Paulson joined the cast playing Olivia de Havilland and Geraldine Page, respectively. In September 2016, it was reported that American Horror Story executive producer Tim Minear would be co-showrunning the series with Murphy. Jackie Hoffman joined the cast as Mamacita, Crawford's housekeeper. In November 2016, Molly Price, Kathy Bates and Alison Wright joined the cast of the series, in the roles of Harriet Foster, Joan Blondell, and Pauline Jameson. In January 2017, it was announced Kiernan Shipka was cast in the series as Davis's daughter, Barbara "B.D." Sherry. Sarandon admitted to initially being "overwhelmed and terrified" about the prospect of portraying Davis accurately. She said, "She's so big and she really was so big, so I tried not to make her a caricature or someone a female impersonator would do ... That was my fear, that she would just be kind of one-dimensional." Lange said her performance was informed by her view that Crawford's "brutal childhood" was masked by the "beautiful, impenetrable veneer of this great, gorgeous movie star ... So she was always on, which is a tremendous burden in and of itself, but always there was this thing lurking underneath of being this poverty-stricken, abused, unloved, abandoned young child and woman." Both Sarandon and Lange researched their roles by reading books by and about Davis and Crawford, and watching and listening to TV performances and recordings. Murphy gave several interviews about Bette and Joan during the 2017 Winter TCA Press Tour. The show's first teaser trailer was released on January 19, 2017, and the second the following day. That same week, Lange and Sarandon appeared on the cover of Entertainment Weekly as Crawford and Davis. FX released another teaser on January 23, two on February 5, one on February 7, and one on February 8. A short commercial for the show also aired during Super Bowl LI. Bette and Joan had its official premiere at the Chinese Theatre in Los Angeles on March 1, 2017. Before the show's premiere, FX held screenings of the pilot episode at several gay bars across the United States. The first season of eight episodes, Bette and Joan, premiered in the United States. on March 5, 2017, and on BBC Two in the United Kingdom. on December 16, 2017. On June 30, 2017, a day before her 101st birthday, actress Olivia de Havilland filed a lawsuit against Feud: Bette and Joan for inaccurately portraying her and using her likeness without permission. The lawsuit stated that the pseudo-documentary-style of the series leads viewers to believe that the statements made by the actress portraying de Havilland in the show are accurate, but that in fact de Havilland had not said such things in real life. The various defendants filed a motion to dismiss under California's "anti-SLAPP" law. The trial court denied the motion but, on March 26, 2018, the California Court of Appeal, Second District, reversed the decision and ordered the lawsuit dismissed on the grounds that no person can "own history". The Court of Appeal further ruled the defendants were entitled to be reimbursed their attorneys' fees. De Havilland filed for estoppels to pursue action with higher courts, securing a restraining order against Murphy and the production company from airing Feud until further review and a court date with the United States Supreme Court. In January 2019, the Supreme Court refused to hear the case. The first season of Feud received highly positive reviews, with major praise for Lange and Sarandon's performances. On review aggregator Rotten Tomatoes, the first season has an approval rating of 91% based on 84 reviews, with an average rating of 8.1/10. The site's critical consensus reads, "While campily and sweetly indulgent, Feud: Bette and Joan provides poignant understanding of humanity, sorrow, and pain while breezily feeding inquisitive gossip-starved minds." On Metacritic, the season has a score of 81 out of 100, based on 44 critics, indicating "universal acclaim". Melanie McFarland of Salon called the writing "creatively wicked" and the series "outrageously fantastic", praising Lange and Sarandon for their performances and for "tempering their decadent rages and vengeful spats with a gutting sense of loneliness that tempers its lightness in solemnity." Verne Gay of Newsday wrote that the series is "Full of joy, humor, brilliant writing and performances, and a deep unabiding love for what really makes Hollywood great—the women." People called the series "bitter, biting and entertaining". The Atlantic's Spencer Kornhaber described the first few episodes as "deft and satisfying" but suggested that "maybe six installments, rather than eight, were all this tale needed". Alan Sepinwall of Uproxx wrote that the series is "big and it's catty, but it's also smart and elegant, with the old Hollywood setting toning down some of Murphy's more scattershot creative impulses." Emily Nussbaum, in The New Yorker, praised Murphy's ambition and lauded both stars, saying of the series, "Beneath the zingers and the poolside muumuus, the show's stark theme is how skillfully patriarchy screws with women's heads—mostly by building a home in there." Not all reviews were positive. Sonia Saraiya of Variety compared Bette and Joan unfavorably to Murphy's The People v. O. J. Simpson: American Crime Story, writing that Feud is "neither as brilliantly campy and hateful as What Ever Happened to Baby Jane? nor as contextualizing and profound as People v. O. J. Simpson." David Weigand of the San Francisco Chronicle gave the series a mixed review, criticizing the script and Lange's performance, but praising Sarandon's, writing: "Lange is always interesting, but she’s only occasionally convincing here as Crawford. The voice is too high, for one thing. Sarandon fares better, as much good as that does with such a lousy script." The Guardian also criticized the series for being "lightweight", noting, "At just eight episodes, there’s almost too much to cover and at times, one craves a little more depth to certain moments." They singled out Lange's performance, however, writing, "Lange in particular moves past just an easy impression to something with far more weight. In a reversal of fortune that would make Crawford cackle in her grave, it’s likely that she’ll be the one up for awards at the end of the year rather than her co-star." The first episode drew 2.26 million live-plus-same-day viewers, which Deadline.com characterized as "solid" and made it the most watched program on FX that week. In comparison, the premiere of The People v. O. J. Simpson attracted 5.1 million viewers in 2016, and the FX limited series Fargo got 2.66 million in 2014. The premiere earned 3.8 million viewers in the Nielsen live-plus-three-days ratings, and 5.17 million viewers total when including two encore broadcasts, making it the highest rated new series debut on FX since The People v. O. J. Simpson. ^ Andreeva, Nellie. "FX Orders Ryan Murphy Series Feud with Jessica Lange, Susan Sarandon". Deadline Hollywood. Retrieved May 5, 2016. ^ a b c Porter, Rick (March 7, 2017). "Sunday cable ratings: Walking Dead at lowest point since Season 2, Feud has decent premiere for FX". TV by the Numbers. Retrieved March 7, 2017. ^ a b Porter, Rick (March 16, 2017). "Sunday cable ratings: The Walking Dead rebounds a little, Feud slips". TV by the Numbers. Retrieved March 16, 2017. ^ a b Metcalf, Mitch (March 21, 2017). "UPDATED: SHOWBUZZDAILY's Top 150 Sunday Cable Originals & Network Finals: 3.19.2017". ShowBuzzDaily. Retrieved March 21, 2017. ^ a b Porter, Rick (March 28, 2017). "Sunday cable ratings: Big Little Lies hits season high, Into the Badlands improves". TV by the Numbers. Retrieved March 29, 2017. ^ a b Porter, Rick (April 4, 2017). "Sunday cable ratings: The Walking Dead finale lowest since Season 2". TV by the Numbers. Retrieved April 4, 2017. ^ a b Metcalf, Mitch (April 11, 2017). "UPDATED: SHOWBUZZDAILY's Top 150 Sunday Cable Originals & Network Finals: 4.9.2017". ShowBuzzDaily. Retrieved April 11, 2017. ^ a b Metcalf, Mitch (April 18, 2017). "UPDATED: SHOWBUZZDAILY's Top 150 Sunday Cable Originals & Network Finals: 4.16.2017". ShowBuzzDaily. Retrieved April 18, 2017. ^ a b Metcalf, Mitch (April 25, 2017). "UPDATED: SHOWBUZZDAILY's Top 150 Sunday Cable Originals & Network Finals: 4.23.2017". ShowBuzzDaily. Retrieved April 25, 2017. ^ DeSantis, Rachel (March 2, 2017). "How Ryan Murphy's early meeting with Bette Davis inspired Feud". Entertainment Weekly. Retrieved March 5, 2017. ^ a b c Garber-Paul, Elisabeth (March 3, 2017). "Feud: Susan Sarandon, Jessica Lange on Reclaiming Bette and Joan". Rolling Stone. Retrieved March 5, 2017. ^ a b c d e f g Lewis, Hilary (February 15, 2017). "Feud's Susan Sarandon, Jessica Lange Reveal How They Channeled Bette Davis, Joan Crawford". The Hollywood Reporter. Retrieved March 4, 2017. ^ a b c Wagmeister, Elizabeth. "Feud: Ryan Murphy Lands Third FX Anthology With Susan Sarandon, Jessica Lange". Variety. Retrieved May 5, 2016. ^ a b Saraiya, Sonia (February 23, 2017). "TV Review: Feud". Variety. Retrieved March 5, 2017. ^ a b McFarland, Melanie (March 4, 2017). "With Feud: Bette and Joan, a Hollywood rivalry for the ages becomes an epic TV experience". Salon. Retrieved March 4, 2017. ^ Rorke, Robert (February 26, 2017). "Why Bette Davis and Joan Crawford's Feud Lasted a Lifetime". New York Post. Retrieved March 3, 2017. ^ Patten, Dominic (February 28, 2017). "Feud Gets Season 2 Order Ahead Of FX Series Premiere; Charles & Diana In Spotlight". Deadline Hollywood. Retrieved February 28, 2017. ^ Andreeva, Nellie; Ramos, Dino-Ray (January 5, 2018). "AHS Season 8 To Be Set In the Future And Updates On Katrina, Coven/Murder House Crossover & Next 'Feud' – TCA". Deadline Hollywood. Retrieved January 5, 2018. ^ Hibberd, James (August 3, 2018). "FX scraps plan for Feud Charles and Diana sequel (for now)". Entertainment Weekly. Retrieved August 3, 2018. ^ Pederson, Erik (August 16, 2016). "Catherine Zeta-Jones To Play Hollywood Legend In Ryan Murphy's Feud At FX". Deadline Hollywood. Retrieved January 12, 2017. ^ Petski, Denise (August 23, 2016). "Sarah Paulson Will Play Geraldine Page In Ryan Murphy's Feud For FX". Deadline Hollywood. Retrieved January 12, 2017. ^ Stanhope, Kate (August 16, 2016). "Catherine Zeta-Jones Joins Ryan Murphy's FX Drama Feud". The Hollywood Reporter. Retrieved January 12, 2017. ^ Andreeva, Nellie. "Ryan Murphy FX Series Feud Sets Tim Minear As Co-Showrunner, Adds Jackie Hoffman To Cast". Deadline Hollywood. Retrieved September 14, 2016. ^ Petski, Denise (November 1, 2016). "Molly Price Joins Ryan Murphy's FX Anthology Series Feud". Deadline Hollywood. Retrieved January 6, 2017. ^ Ausiello, Michael. "Kathy Bates Joins Ryan Murphy's Feud as Bette Davis' BFF Joan Blondell". TVLine. Retrieved November 3, 2016. ^ Petski, Denise (November 9, 2016). "Alison Wright Joins Ryan Murphy's FX Anthology Series Feud". Deadline Hollywood. Retrieved January 12, 2017. ^ a b Abrams, Natalie (January 12, 2017). "Jessica Lange uses famed Amy Schumer sketch to explain Feud relevance to today". Entertainment Weekly. Retrieved March 5, 2017. ^ Nilles, Billy (January 12, 2017). "Why Feud Will Never Tackle Taylor vs. Katy in the Future". E! Online. Retrieved February 9, 2017. ^ Brill, Karen (January 21, 2017). "The First Teasers for FX's Feud: Bette and Joan Cut Straight to the Chase With a Dead-Rat Feast". Vulture.com. Retrieved February 9, 2017. ^ Cagle, Jess (January 19, 2017). "This Week's Cover: Inside Ryan Murphy's Feud: Bette and Joan". Entertainment Weekly. Retrieved February 9, 2017. ^ @feudfx (January 23, 2017). "They drove fans wild. They drove each other crazy" (Tweet). Retrieved February 9, 2017 – via Twitter. ^ @feudfx (February 5, 2017). "Jessica Lange is Joan Crawford. Susan Sarandon is Bette Davis. Prepare for a FEUD of biblical proportions 3/5 on @FXNetworks" (Tweet). Retrieved February 9, 2017 – via Twitter. ^ @feudfx (February 5, 2017). "Their movie made millions. Their hatred made history" (Tweet). Retrieved February 9, 2017 – via Twitter. ^ @feudfx (February 7, 2017). "Pucker up" (Tweet). Retrieved February 9, 2017 – via Twitter. ^ @feudfx (February 7, 2017). "At each other's throats from the very start. 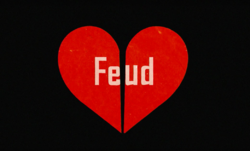 Check out the killer opening titles from Feud: Bette and Joan" (Tweet). Retrieved February 9, 2017 – via Twitter. ^ Harnick, Chris (February 6, 2017). "This Is the Super Bowl Commercial All TV Fans Are Talking About". E! Online. Retrieved February 9, 2017. ^ Haar, Kara (March 2, 2017). "Feud Premiere: Sexism, Ageism Talked About on Red Carpet". The Hollywood Reporter. Retrieved March 5, 2017. ^ "'FEUD: Bette And Joan' Screening Series At A Gay Bar Near You! | Instinct". Instinctmagazine.com. February 21, 2017. Retrieved May 15, 2017. ^ "Feud: Bette and Joan (episode one)". BBC Media Centre. Retrieved November 27, 2017. ^ "Olivia de Havilland sues FX over Feud: Bette and Joan". BBC News. July 1, 2017. Retrieved August 3, 2018. ^ Yorke, Harry (July 1, 2017). "Dame Olivia de Havilland sues US network FX for 'completely false' portrayal in new series Feud". The Telegraph. Retrieved August 3, 2018. ^ "De Havilland v. FX Networks LLC, et al., Case No. B285629 Slip Opinion" (PDF). ^ "Supreme Court won't hear Olivia de Havilland case that Feud depicted her as gossipmonger". USA Today. January 7, 2019. Retrieved February 19, 2019. ^ "Feud: Bette and Joan (2017)". Rotten Tomatoes. Retrieved January 11, 2018. ^ "Feud: Season 1". Metacritic. Retrieved March 13, 2017. ^ Gay, Verne (March 1, 2017). "Feud: Bette and Joan makes a powerful case". Newsday. Retrieved March 7, 2017. ^ Gliatto, Tom (March 5, 2017). "REVIEW: FX's Feud: Bette and Joan Is Bitter, Biting and Entertaining". People. Retrieved March 7, 2017. ^ Kornhaber, Spencer (March 3, 2017). "Feud: Bette and Joan Deconstructs a Rivalry for Tragedy, Not Comedy". The Atlantic. Retrieved March 7, 2017. ^ Sepinwall, Alan (March 2, 2017). "Ryan Murphy's Feud: Bette And Joan Is More Than One Long Catfight". Uproxx. Retrieved March 8, 2017. ^ Nussbaum, Emily (March 20, 2017). "Feud: A Bittersweet Beauty". The New Yorker. Retrieved April 5, 2017. ^ Weigand, David (March 2, 2017). "Feud has a fighting chance, Time is of the essence in 2 other new shows". San Francisco Chronicle. Retrieved March 8, 2017. ^ Lee, Benjamin (March 3, 2017). "Feud: Bette and Joan review – dueling Hollywood dames make for frothy drama". The Guardian. Retrieved June 24, 2017. ^ Andreeva, Nellie (March 7, 2017). "FX's Feud Has Respectable Ratings Start". Deadline Hollywood. Retrieved March 7, 2017. ^ Andreeva, Nellie (March 10, 2017). "FX's Feud Has Solid Ratings Start In Live+3". Deadline Hollywood. Retrieved March 12, 2017. ^ Littleton, Cynthia (March 10, 2017). "Feud Grabs FX's Highest Series Debut Ratings Since People V. O.J. Simpson". Variety. Retrieved March 12, 2017. ^ Porter, Rick (March 12, 2017). "'Feud' both behind and ahead of recent FX debuts: Cable Live +3 ratings for Feb. 27-March 5". TV by the Numbers. Retrieved April 15, 2017. ^ Porter, Rick (March 24, 2017). "'The Americans' premiere triples in cable Live +7 ratings for March 6–12". TV by the Numbers. Retrieved April 15, 2017. ^ Porter, Rick (March 30, 2017). "'The Walking Dead' makes up for losses in cable Live +7 ratings for March 13–19". TV by the Numbers. Retrieved April 15, 2017. ^ Porter, Rick (April 6, 2017). "'Major Crimes' makes major gains in cable Live +7 ratings for March 20–26". TV by the Numbers. Retrieved April 6, 2017. ^ Porter, Rick (April 13, 2017). "'Underground' makes a big leap in cable Live +7 ratings for March 27-April 2". TV by the Numbers. Retrieved April 13, 2017. ^ Porter, Rick (April 20, 2017). "'Archer' premiere doubles in cable Live +7 ratings for April 3–9". TV by the Numbers. Retrieved April 20, 2017. ^ Porter, Rick (April 26, 2017). "'Better Call Saul' makes big gains in cable Live +7 ratings for April 10–16". TV by the Numbers. Retrieved April 26, 2017. ^ Porter, Rick (May 4, 2017). "'Fargo' premiere makes solid gains in cable Live +7 ratings for April 17–23". TV by the Numbers. Retrieved May 4, 2017. ^ Littleton, Cynthia (January 8, 2018). "'Big Little Lies' Team Says Female-Focused Stories Are 'Good Business'". Variety. Retrieved January 8, 2018. ^ Greenwood, Carl (January 8, 2018). "Golden Globes 2018 winners in full: Big Little Lies dominates as Gary Oldman wins best actor". The Sun. Retrieved January 8, 2018. ^ Littleton, Cynthia (January 8, 2018). "Nicole Kidman Speaks Out Against Abuse in Golden Globes Speech". Variety. Retrieved January 8, 2018. ^ Perez, Lexie (January 8, 2018). "Golden Globes: Nicole Kidman Wins Best Actress in a Limited Series for 'Big Little Lies'". The Hollywood Reporter. Retrieved January 8, 2018. ^ Cooper, Nathanael (January 8, 2018). "Golden Globes 2018 live: All the winners from Hollywood's awards night". The Sydney Morning Herald. Retrieved January 8, 2018. ^ "Alfred Molina". Los Angeles Times. Retrieved January 11, 2018. ^ "Hollywood Music in Media Awards: Full Winners List". The Hollywood Reporter. November 17, 2017. Retrieved November 18, 2017. ^ TCA webmaster (June 19, 2017). "The Television Critics Association Announces 2017 TCA Award Nominees". Television Critics Association. TCA. tvcritics.org. Retrieved June 19, 2017. ^ McNary, Dave. "'Star Wars: The Last Jedi,' 'Dunkirk,' 'Lady Bird' Nab Art Directors Guild Nominations". Variety. Retrieved January 4, 2018. ^ Dupre, Elyse (January 5, 2018). "2018 Producers Guild Award Nominations: The Full List of Film and TV Nominees". E! News. Retrieved January 5, 2018. ^ "'Greatest Showman,' 'Young Pope,' 'Phantom Thread' Earn Costume Designers Guild Nominations". Variety. January 10, 2018. Retrieved January 10, 2018.